Marinate chicken in fish sauce for 1 hour. Dissolve the cornstarch in beef broth then set aside. Heat oil in a pan.Add the marinated chicken and cook until it turns brown. Add garlic, chili peppers, onions and bell peppers.Stir. Add the oyster sauce, pineapple chunks and sugar. Add the cornstarch and broth mixture. Season with salt if the taste is a little bland for you. 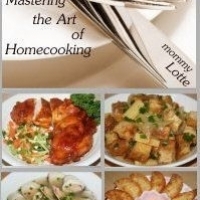 Like mommylotte's recipes? Never miss an upload!